Finally a Shoe Without a Footprint! "We recycle metal, plastic, paper, so why not carbon dioxide?" 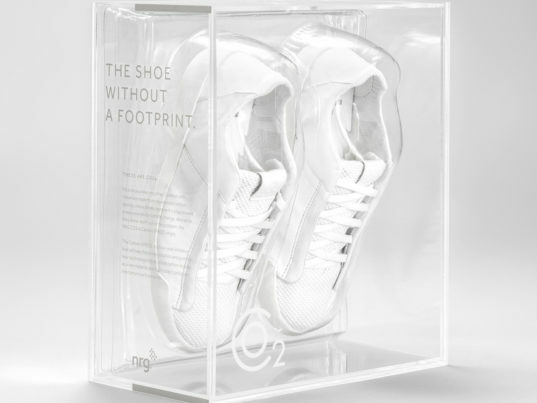 That’s the question that NRG Energy posed to the audience on Wednesday at New York Fashion Week, when they unveiled a prototype “Shoe Without a Footprint” is symbolic of NRG Energy’s commitment to reducing and repurposing carbon emissions, Kinney said. With a contemporary style courtesy of former Nike designer Dwayne Edwards, the shoe is also the type of innovation that NRG Energy hopes to see at the 20 million dollar CosiaCarbonXPrize. Check out this video of a shoe that sequesters co2.